“Once one sees the distinction between pure awareness and the luminous aspect of the phenomenal world …” Almost every word in this instruction is a mini-instruction! In this meditation the focus is “the luminous aspect.” We have encountered this in many meditations. Quite often it is the immediate experience in the first seconds of a sitting. For most people, this experience is pure awareness. It is not profound, pure awareness, but is pure and is awareness compared to what normally occupies one’s mind. This is experienced as luminous or bright, clear or transparent, simple and unadorned, perfect as it is. One feels present as Presence. Excellent! But, by analogy, this experience is like a child learning to doggy paddle saying “I can swim,” compared to an Olympic swimmer. Yes, the child is swimming, and yes, one is experiencing pure awareness, yet there is so much more that is possible. 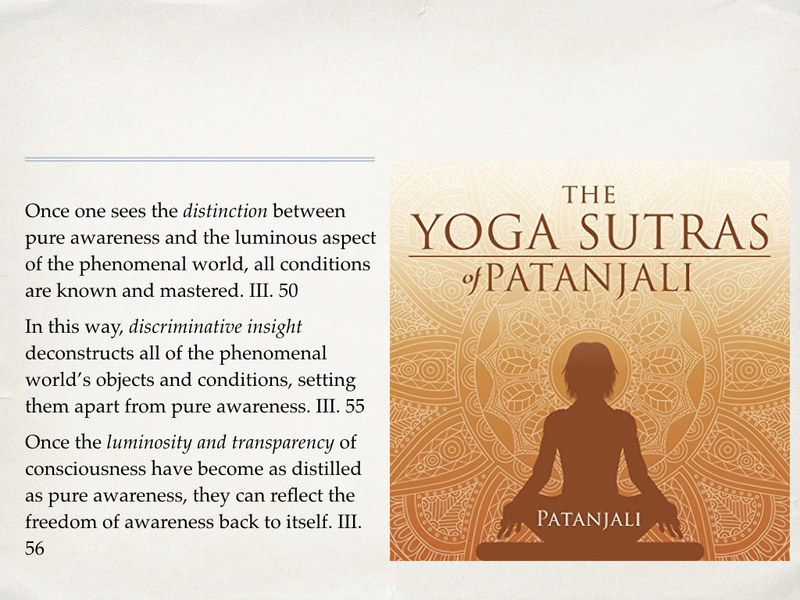 Patanjali gives us pause, then, when he says that we are to experience the “distinction between pure awareness and the luminous aspect of the phenomenal world.” This requires the former experience of pure awareness plus perceiving through daily phenomena to the luminous nature that actually is presenting as the experiences of life. In Buddhist advancing meditation and life practice this is part of Mahamudra. In this regard, one technique that will support Patanjali’s and the Buddha’s instructions is encouraging oneself to simplicity of thought and purity of emotion. This is accomplished through living as selflessly as one can. Not only does this bolster in-the-moment Presence but consistently undensifies the phenomenal world. The latter results because the perception of density is a by-product not being Presence, pure awareness. Presence “deconstructs all of the phenomenal world’s objects and conditions” not by doing anything but by fact of Being. Pure Awareness is “discriminative insight” because pure awareness is pure Awareness. Meditation training, then, is the habitualizing of one’s waking consciousness to its innate luminosity and transparency. These are attributes of pure Awareness; and Awareness is the genetrix of all states and forms of consciousness and cognition. Our problem, so to speak, is that we don’t know there is a mother-nature. We, like the child learning to swim, only know what we know. Meditation constantly tantilizes us with the more that we are innately, like the Olympic swimmer was once a child learning to doggy paddle. Patanjali adds one more important teaser. “Once the luminosity and transparency of consciousness have become as distilled as pure awareness, they can reflect the freedom of awareness back to itself.” Consciousness rarely engages its own luminosity and transparency, let alone cognizes these same attributes within the experiences of perception called phenomenal existence. But, as clarity and voidness are consciously cultivated, consciousness purifies thus does its perception of phenomena. With this, phenomena is also freed from the densifications that an impure and circumscribed consciousness put upon existence. Now, consciousness is becoming distilled, purified. One will then begin to experience the sameness, or one taste, of Awareness whether expressing through phenomena, through cognitation and consciousness, or through Itself. Patanjali has described what within Mahayana and Vajrayana Buddhist teachings is understood as Mirror-like Wisdom, also called Reflective Wisdom. Pure Awareness and all that awareness IS perfectly report each other to each other, like a mirror perfectly reports what stands before it. The mirror cannot fabricate something alternative. In truth, phenomena doesn’t either. The simplicity is that phenomena is Awareness expressing. Existence is Awareness, Awareness is Existence. Visit www.blazinglight.net for additional meditations and blog posts. This entry was posted in Consideration, Mahayana, Meditations. Bookmark the permalink. Click "Follow" to receive posts in your in-box. Stay connected! Enter your email address in order to follow this blog and receive new posts by email. Road trip: water, beavers, otters?